Social gaming (games played via social networks) and casual games (games usually played on mobile devices, such as the iPhone) are a significantly different form of gaming from more recognisable videogames, such as MMORPGs, first-person shooters and so on. As part of an ARC-funded linkage project, I have been exploring Zynga’s Farmville and Rovio’s Angry Birds as significant exemplars of social and casual gaming respectively. This project is funded and framed by the the following grant: Prof Mark Balnaves, Mr Jonathan N Noal, Prof Gary G Madden, A/Prof Philip J Moore, Dr Michele A Willson, Dr Tama B Leaver. (Curtin University) ARC Linkage Grant LP110200026. Online Money and Fantasy Games an applied ethnographic study into the new entrepreneurial communities and their underlying designs. $69,000 (2011-2013). 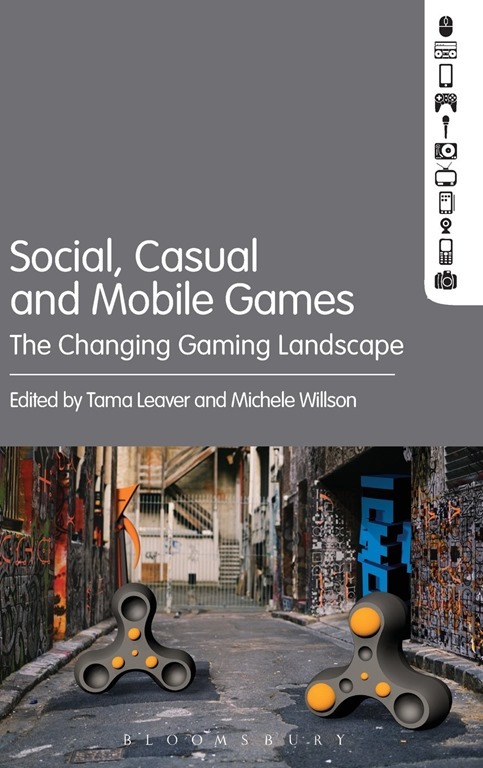 Michele Willson and I have recently completed an edited collection published by Bloomsbury Academic in early 2016 entitled Social, Casual and Mobile Games: The Changing Gaming Landscape, which includes my chapter on ‘Angry Birds as a social network market’. Leaver, T., & Willson, M. (Eds.). (2016). Social, Casual and Mobile Games: The Changing Gaming Landscape. London and New York: Bloomsbury Academic. Leaver, T., & Willson, M. (2016). 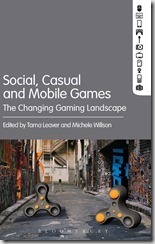 Social networks, casual games and mobile devices: the shifting contexts of gamers and gaming. In T. Leaver & M. Willson (Eds. ), Social, Casual and Mobile Games: The Changing Gaming Landscape. London and New York: Bloomsbury Academic. Leaver, T. (2016). Angry Birds as a Social Network Market. In T. Leaver & M. Willson (Eds. ), Social, Casual and Mobile Games: The Changing Gaming Landscape. London and New York: Bloomsbury Academic. Leaver, T., & Lloyd, C. (2015). Seeking Transparency in Locative Media. In R. Wilken & G. Goggin (Eds. ), Locative Media (pp. 162–174). London & New York: Routledge. Balnaves, M., M. Willson, and T. Leaver (2012), “Entering Farmville: Finding Value in Social Games” in C. Anyanwu, K. Green, J. Sykes (Eds), Refereed Proceedings of the Australian and New Zealand Communication Association conference: Communicating Change and Changing Communication in the 21st Century, ISSN 1448-4331. Willson, M. and Leaver, T. ‘Farm Villains? The Ethics of Social Media Data Mining’, presented at the International Telecommunications Society 6th Africa-Asia-Australasia Regional Conference, Curtin University, Perth, 7 August 2013. Leaver, T. ‘Situating Mobile Casual Games as a Social Network Market with Rovio’s Angry Birds as a Case Study’ presented at the International Telecommunications Society 6th Africa-Asia-Australasia Regional Conference, Curtin University, Perth, 7 August 2013. Willson, M. and Leaver, T. ‘FarmVillains? Social Games, Data Mining and the Social Media Contradiction’, Australian and New Zeland Communication Association (ANZCA) Annual Conference, Fremantle, Western Australia, 4 July 2013. Leaver, T. ‘Angry Birds as a Social Network Market’, Social, Casual, Mobile: Changing Games ANZCA PreConference, Perth, Western Australia, 2 July 2013.